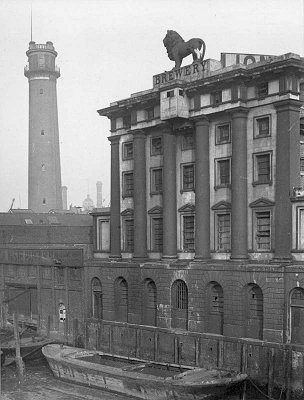 The Lion Brewery, a prominent riverside landmark in Lambeth, just before it was demolished in 1949 for the building of the Royal Festival Hall. The pilastered building was the storehouse, designed in 1836 by Francis Edwards for the Coding family. As the section shows, the storehouse was massively constructed of load-bearing brick with an all-iron interior, a typical form of construction for Victorian warehouses, with floors of barrel-vaulted brick arches and timber joisting. It became disused in 1924 and badly damaged by fire in 1931, and was almost derelict thereafter. The Shot Tower to the left was retained during the Festival of Britain in 1951 and was afterwards demolished for the building of the Queen Elizabeth Hall. The lion on top of the building was made of Coade Stone.